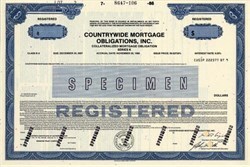 Beautifully engraved certificate from Countrywide Mortgage Obligations, Inc. This historic document was printed by the American Banknote Company and has an ornate border around it with the company's name on top and the words "Collateralized Mortgage Obligation" below the name. This item has the printed signatures of the Company’s Chairman and Secretary and is over 30 years old. Since July 1, 2008, when the deal officially closed, the bank’s mortgage business has lost $52.7 billion thanks to Countrywide Financial Corporation. This includes settlements, payments to investors for bad loans, accounting writedowns, and operating losses and profits. The 52.7 Billion doesn't include the initial cost of $2.5 billion. Oh my. Legally, a CMO is a debt security issued by an abstraction - a special purpose entity - and is not a debt owed by the institution creating and operating the entity. The entity is the legal owner of a set of mortgages, called a pool. Investors in a CMO buy bonds issued by the entity, and they receive payments from the income generated by the mortgages according to a defined set of rules. With regard to terminology, the mortgages themselves are termed collateral, 'classes' refers to groups of mortgages issued to borrowers of roughly similar credit worthiness, tranches are specified fractions or slices, metaphorically speaking, of a pool of mortgages and the income they produce that are combined into an individual security, while the structure is the set of rules that dictates how the income received from the collateral will be distributed. The legal entity, collateral, and structure are collectively referred to as the deal. The term "collateralized mortgage obligation" technically refers to a security issued by specific type of legal entity dealing in residential mortgages, but investors also frequently refer to deals put together using other types of entities such as REMICs as CMOs. Countrywide Mortgage Obligations Inc. was a subsidiary of Countrywide Credit Industries. Countrywide Mortgage Obligations Inc. resold Collateralized Mortgage Obligations. On November 12, 2002, Countrywide Credit Industries Inc. changed its name to Countrywide Financial Corp. to reflect its expansion into banking, insurance and other financial businesses. Collateralized Mortgage Obligations are a type of mortgage-backed security that creates separate pools of pass-through rates for different classes of bondholders with varying maturities, called tranches. The repayments from the pool of pass-through securities are used to retire the bonds in the order specified by the bonds' prospectus. Countrywide Financial Corporation is a diversified financial marketing and service holding company engaged primarily in residential mortgage banking and related businesses. It is a wholly owned subsidiary of Bank of America (NYSE: BAC). Mortgage Banking, which originates purchases, securitizes, and services mortgages. In 2006 Countrywide financed 20% of all mortgages in the United States, at a value of about 3.5% of United States GDP, a proportion greater than any other single mortgage lender. Banking, which operates a federally chartered thrift that primarily invests in mortgage loans and home equity lines of credit primarily sourced through its mortgage banking operation. Capital Markets, which operates as an institutional broker-dealer that primarily specializes in trading and underwriting mortgage-backed securities. Global Operations, which provides mortgage loan application processing and loan servicing. During the year ended December 31, 2005, for example, the Mortgage Banking segment generated 59% of the Company's pre-tax earnings. On January 11, 2008, Bank of America announced that it plans to purchase Countrywide Financial for $4.1 billion in stock. On June 5, 2008, Bank of America Corporation announced it had received approval from the Board of Governors of the Federal Reserve System to purchase Countrywide Financial Corporation. On June 25, 2008, Countrywide announced it had received the approval of 69% of its shareholders to planned merger with Bank of America. On July 1, 2008, Bank of America Corporation completed its purchase of Countrywide Financial Corporation. Countrywide was founded in 1969 by David Loeb and Angelo Mozilo. Loeb died in 2003. The initial public offering was less than successful, with company stock trading over the counter at less than $1 per share. In 1985 Countrywide stock was re-listed on the New York Stock Exchange under the ticker symbol CFC. CFC has been described as the "23,000% stock" by Fortune magazine. Between 1982 and 2003, Countrywide delivered investors a 23,000% return, exceeding the returns of Washington Mutual, Wal-Mart, and Warren Buffett's Berkshire Hathaway. The Mortgage Banking segment produces mortgage loans through a variety of channels on a national scale. Nearly all of the mortgage loans the company produces in this segment are sold into the secondary market, primarily in the form of mortgage-backed securities. In 2006, 45% of those mortgages were conventional non-conforming loans, loans too large to sell to Fannie Mae. The company generally performs the ongoing servicing functions related to the mortgage loans that it produces. It also provides various loan closing services, such as title, escrow and appraisal. Loan Servicing services loans, i.e. collects payments from the borrower, handles escrow accounts, tax and/or insurance payments (if applicable), then remits "advances" to the investor's trustee as specified in the Pooling and Servicing Agreement (PSA). Loan Servicing typically retains a fraction of the payment made (typically 25 - 45 basis points of the unpaid principal balance) as a "servicing fee". The Banking segment consists of Countrywide Bank, FSB and Countrywide Warehouse Lending. Formerly, the bank was known as Countrywide Bank, N.A., a nationally chartered bank that was regulated jointly by the Office of the Comptroller of the Currency and the Federal Reserve, but it converted its charter to a federally chartered thrift that is regulated by the Office of Thrift Supervision. Countrywide Bank is the 3rd largest Savings and Loan institution and is the fastest growing bank in United States history. Assets from deposits are currently approaching $125 billion. Countrywide Bank primarily originates and purchases mortgage loans and home equity lines of credit for investment purposes. The majority of these loans are sourced through its mortgage banking subsidiary, Countrywide Home Loans. The Bank obtains retail deposits, primarily certificates of deposit, through the Internet, call centers and more than 200 financial centers, many of which are located in Countrywide Home Loans' retail branch offices as of April 1, 2007. Balboa Life and Casualty Group underwrite property, casualty, life and credit insurance in all 50 states through the Balboa Life and Casualty Group. Its products include Lender-Placed Property and Auto, which includes lender-placed auto insurance and lender-placed, real-property hazard insurance; Voluntary Homeowners and Auto, which underwrites retail homeowners insurance and home warranty plans for consumers, and Life and Credit, which underwrites term life, credit life and credit disability insurance products. By 2005, GHL operation processed more than 11.3 billion pounds sterling ($20.3 billion) in loans, all of which are subserviced for Barclays, PLC, the joint venture partner. As of December 31, 2005, Global's subservicing portfolio was 59 billion pounds sterling ($102 billion). In 2003, Countrywide was the subject of a class-action lawsuit alleging overtime violations. Countrywide was charged with working employees 10-15 hours per day, 6 to 7 days per week without compensating them for overtime wages. . The lawsuit was settled in May 2005, with the payment of $30 million in compensation to 400 account executives . Additionally, Countrywide is one of many companies that conducts in-depth background searches of new employee applicants. The background search goes beyond typical employment, education, and criminal history searches, and enables a company to view the applicant's credit, and public record documents such as lawsuits and divorce records. Although it must be authorized by the applicant, Countrywide explicitly does not consider applicants who deny authorization for a search. This policy has led to otherwise qualified applicant complaints and dispute filings which claim this policy is discriminatory, invasive, and compromises the applicant's privacy. Countrywide claims to be the top lender to minorities, but they agreed to a settlement with New York state attorney general Elliot Spitzer because of alleged overpayments by minorities. Countrywide agreed to compensate minorities borrowers and improve minority lending oversight. It is noted that the same fee structure that prompted this settlement was applied to all borrowers and not just minorities. Countrywide subprime documents show policy of lending to families with as little as $1000 of disposal income, often compromising their ability to pay living expenses. This guideline was not established by Countrywide, but rather the investors to whom they sold their loans. However Countrywide had no qualms in following through despite it knowing those families would likely fail to make monthly payments: these loans would be sold to investors shortly after anyway. Employees were given scripts as a sales aid when talking to customers about taking out loans. Countrywide has massive exposure to the USA Sub-Prime market and as a result the company value has decreased, and there is a real risk of administration. Some customers have complained that after the devastating hurricanes Katrina and Rita, Countrywide told loan customers in the affected areas that they could take a break on payments without any late fees, and the payments would be added back to the end of the loan. They now contend that Countrywide forced the loan customers to pay the missed payments in a lump sum, along with late fees they were told they didn't have to pay, within 30 days or face foreclosure. Bear in mind that Countrywide services these loans on behalf of investors that purchase these loans. It is these investors that Countrywide collect these payments, it is not Countywide's decision. In June 2008 Conde Nast Portfolio reported that numerous Washington, DC politicians over recent years had received mortgage financing at noncompetitive rates because the corporation considered the officeholders "FOA's"--"Friends of Angelo". The politicians extended such favorable financing included the chairman of the Senate Banking Committee, Democrat Christopher Dodd, and the chairman of the Senate Budget Committee, Democrat Kent Conrad. The article also noted Countrywide's political action committee had made large donations to Dodd's campaign. Democrat Senator Dodd proposed that the federal government buy up to $400 Billion in defaulted mortgages. Citizens for Responsibility and Ethics in Washington (CREW) has called for House and Senate to investigate Senators Conrad and Dodd. It was reported that James Johnson, former CEO of Fannie Mae and an adviser to Democratic presidential candidate Barack Obama, had received loans under the "Friends of Angelo". Johnson announced he would step down from the vice-presidential vetting position on June 11, 2008 in order to avoid being a distraction to Obama's campaign. California Attorney General, Jerry Brown, followed suit by filing a similar lawsuit on June 25, 2008, accussing the lender of breaking the state's laws against false advertising and unfair business practices. The lawsuit also claims the defendent mislead many consumers by misinforing them about the workings of certain mortgages such adjustable-rate mortgages, interest-only loans, low-documentation loans and home-equity loans while telling borrowers they would be able to refinance before the interest rate on their loans adjusted. When Countrywide finances mortgage loans, they usually package them for sale to large investors as mortgage backed securities. Fannie Mae or Freddie Mac can only buy loans which conform to the standards of government sponsored enterprises. Non-conforming mortgages securities must be sold in the private, secondary market to alternative investors. On August 3, 2007, this secondary market essentially stopped the sales of most of the non-conforming securities. Secondary mortgage market disruptions had happened previously, but, the new disruption appeared more serious, both larger in range and likely duration. Alt-A mortgages (loans given to apparently creditworthy borrowers without much or any documentation) completely stopped at ratings lower than AAA. Difficulties extended to much of AAA-rated mortgage-backed securities. Only securities with conforming mortgages were trading. Countrywide Financial issued a statement that its mortgage business has access to a nearly $50 billion funding cushion. "Since the company is highly dependent on the availability of credit to finance its operations, disruptions in the debt markets or a reduction in our credit ratings could have an adverse impact on our earnings and financial condition, particularly in the short term… Current conditions in the debt markets include reduced liquidity and increased credit risk premiums for certain market participants. These conditions, which increase the cost and reduce the availability of debt, may continue or worsen in the future…. There can be no assurance, however, that the Company will be successful in these efforts, that such facilities will be adequate or that the cost of debt will allow us to operate at profitable levels." This raised speculation that Countrywide was a potential bankruptcy risk. On August 10, a run on the bank began as the secondary mortgage market shutdown, curtailing new mortgage funding. The perceived risk of Countrywide bonds rose. Fitch, Moody's and Standard and Poors credit ratings agencies downgraded Countrywide 1 or 2 grades, some to near junk status. The cost of insuring its bonds rose 22% overnight. This also limited its access to short-term debt called commercial paper. This is often cheaper than bank loans. Some institutional investors admitted trying to sell the Countrywide paper. Fifty other mortgage lenders had already filed for Chapter 11 bankruptcy, and Countrywide Financial was cited as a possible bankruptcy risk by Merrill Lynch and others on August 15. This combined with news that its ability to issue new commercial paper might be severely hampered put severe pressure on the stock. Its shares fell $3.17 to $21.29, which was its biggest fall in a single day since the crash of 1987 - the shares had fallen 50% so far that year. On Thursday, August 16 the company expressed concerns over liquidity because of the decline of the secondary market for securitized mortgage obligations. Countrywide also announced its intent draw on the entire $11.5 billion credit line from a group of 40 banks including JPMorgan Chase. On Friday August 17, many depositors sought to withdraw their bank accounts. It also planned to make 90% of its loans conforming. By this point stock shares had lost about 75% of their peak value and speculation of bankruptcy broadened. At the same time the Federal Reserve Bank lowered the discount rate 0.5% in a last-minute, early morning conference call. The Fed accepted about $17.2 billion in repurchase agreements for mortgage backed securities to aid in liquidity. This also helped calm the stock market and investors promptly responded positively with the Dow posting gains. In a letter dated August 20, Federal Reserve agreed to waive banking regulations at the request of Citigroup and Bank of America. The Fed agreed to exempt both banks from rules that limited the amount that federally-insured banks can lend to related brokerage companies to 10% of bank capital. Until then, banking regulation was that banks with federally insured deposits should not be put at risk by brokerage subsidiaries' activities. On August 23, Citibank and Bank of America said that they and two other banks accessed $500 million in 30-day financing at the Fed's discount window. The same day, Countrywide Financial obtained $2 billion of new capital from Bank of America Corp. For this the Bank of America brokerage arm would get convertible preferred stock. From 2005 to 2007 Angelo R. Mozilo sold much of his CFC stock realizing $291.5 million in profits. A class action suit was filed on behalf of shareholders alleging securities violations. On January 11, 2008, Bank of America announced it had agreed to buy Countrywide for $4 billion in an all-stock transaction. The deal is expected to close in the 3rd quarter of 2008. The stock's value settled at about $5 1/2 per share following the announcement; it had been as low as $4.43 before the Bank of America deal was announced. On August 15, 2007, Merrill Lynch advised its clients to sell their stock in Countrywide. The stock had lost over 57% YTD through September 7, 2007. In September 2007 Countrywide announced a major public relations campaign titled "Protect Our House" to address negative reactions to its corporate downsizing and mortgage defaults and foreclosures. The campaign was to be run by Burson-Marsteller, a firm run by prominent pollster Mark Penn. Countrywide employees were not required to sign a pledge of support to the company or the campaign, however, by doing so employees were issued green wrist bands. One wrist band sold on ebay for $152, despite the wrist bands being made in China for pennies a piece. It is unknown if an employee sold the wrist band or if someone else sold it after obtaining it from an employee. The endgame in Bank of America's $4 billion takeover of Countrywide Financial began with a December phone call from Countrywide Chief Executive Angelo Mozilo to his Bank of America counterpart, Kenneth D. Lewis. After more than six months of financial deterioration at Countrywide -- despite a $2 billion infusion of cash from Bank of America in August -- Mozilo said he was ready to throw in the towel, according to Lewis. Bank of America deployed 60 analysts from its headquarters in Charlotte, N.C., to Countrywide's headquarters in Calabasas, Calif. After four weeks analyzing Countrywide's legal and financial predicament, and modeling how its loan portfolio was likely to perform, Bank of America offered an all-stock deal valued at $4 billion for Countrywide -- a fraction of the company's $24 billion market value a year ago. Countrywide shareholders approved the deal on June 25, 2008 and it is expected to close July 2, 2008. Bank of America announced on June 26, 2008 that the takover of Countrywide Financial Corp. will result in the loss of 7,500 jobs over the next two years.